then you can physically forget about it. Malik Ali, CEO of Body Bangout has extensive knowledge and experience in the Health and Wellness industry. Through working out personally; he found his passion of working with, coaching and empowering people to reach their fitness goals. Malik’s vision is to assist individuals to achieve fitness aspirations they never thought possible for themselves. Through his Body Bangout classes and personal training curriculum; he guides them to develop the necessary tools to live a healthy lifestyle. Malik is a motivational trainer who has developed a unique format in which he challenges his clients to be relentless in their determination to accomplish and maintain their fitness goals. Malik is extremely creative in his approach in developing workout routines which targets the muscles from various angles. This in turn provides an exclusive workout that is effective and fun which eliminates the negative connotation that is associated with working out. Each of his Body Bangout classes and personal training sessions are customized to each client. In addition, Malik incorporates a clear cut efficient meal plan to compliment the workouts to accomplish any and every fitness goal his clients set for themselves in spite of their past or current circumstances. Malik works with those looking to simply lose a few pounds to those who are in the fight of their life. Malik has a proven track record of RESULTS! Malik specializes in weight loss, strength and conditioning, nutrition, core training, and the maintenance of a healthy lifestyle. Malik received his Personal Training certificate from I.S.S.A. 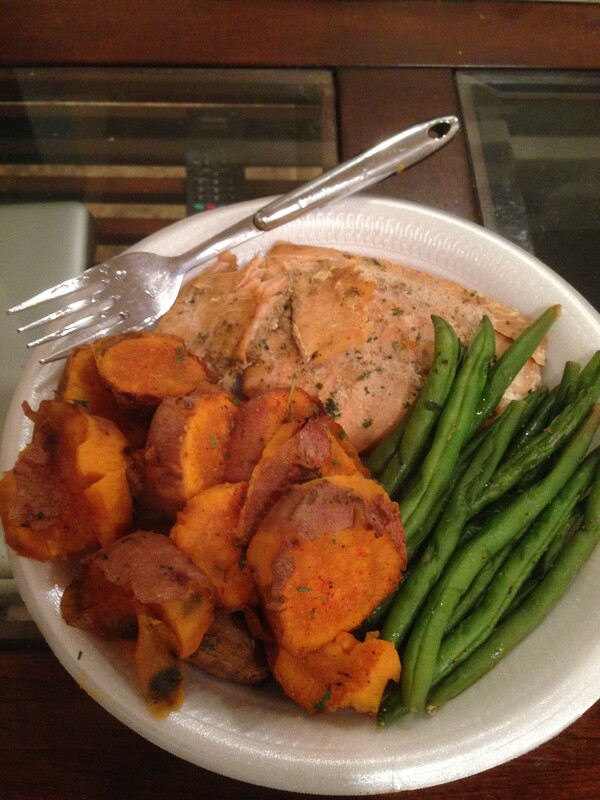 Honey Lemon Pepper Chicken Cutlets With Sweet Potatoes and Veggies! Squeeze a whole lemon and a quarter cup of honey in a measuring cup; stir lemon and honey until completely mixed then mix 1/2 a teaspoon of pepper, garlic powder and 1/2 teaspoon of seasoned salt and two teaspoons of parsley. Brush mixture evenly on chicken cutlets. Cover chicken with aluminum foil and place in oven at 425 degrees for 35 minutes. Wrap sweet potatoes in aluminum foil and bake for 1 hour at 425 degrees. 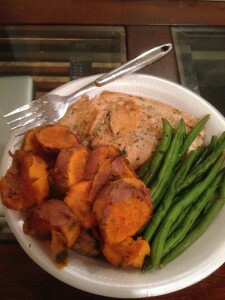 Upon removing sweet potatoes, slice potatoes and season to your desire and place in oven for an additional 20 minutes. Steam vegetables and season lightly with season salt, onion powder, and a little bit of garlic powder! Next Body Bangout Cardio Boot Camp!